around three weeks ago, we had a shoot at the palawan suites of makati shangri-la. 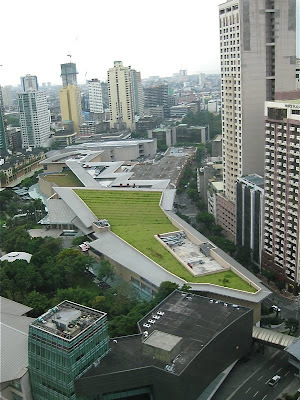 while looking out the windows, we spotted this unusual thing on the makati-avenue side—something green in the middle of all that dreary gray concrete: the lower half of the photo is ayala museum and above that is... greenbelt 5?! wow, let's take a closer look... is that—gasp!—grass?? ayala is actually doing something green?? literally and figuratively. to deserve to be called a "green belt." 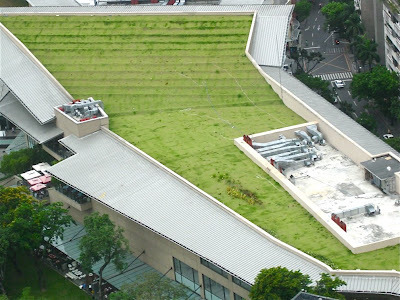 we're really curious about this rooftop. we didn't know it even existed. is it accessible to customers? pwede bang mag-picnic jan? parang maganda mag-fashion shoot jan... we tried googling for some information on this, but could not find anything, not even in their not-exciting website. can anyone enlighten us please? Nice to see you blogging regularly again. That three-week vacation must have been exactly what you needed! several countries in europe have started doing this in their bigger cities. 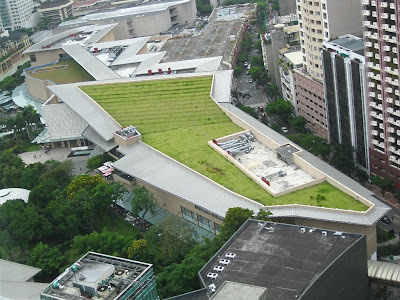 some just have grass and some even have landscaped gardens on their rooftop. it's supposed to slow down the greenhouse effect, cool down the building and produce more oxygen. in germany (i think), buildings are now required to have this atop their buildings. i saw a documentary of this at national geographic or discovery (can't remember). hope this helps. this actually make the building cooler. it slows down the greenhouse effect.